Whenever your skin is broken, you run the risk of an infection. Since worksites (factories, warehouses, hospitals, offices) are not sterile environments, any object that penetrates your skin will likely carry germs. These germs can spread rapidly in your body causing massive infection and sometimes life threatening illness. This is why you must not wait before having your wound evaluated by a medical doctor. 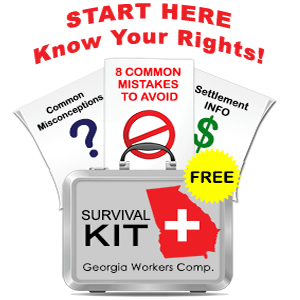 Under Georgia workers’ compensation law, your employer will be responsible for payment of emergency treatment and puncture wounds by their nature are emergencies. Second, you will need treatment for the underlying injury. Often wounds from objects piercing the skin or breaking bones will be extremely painful and can require immobilization. You may need physical therapy to allow full function to be restored. In other cases, your injuries may be permanent. Eye injuries, joint injuries, and closed head wounds may result in a permanent medical impairment. Our office has extensive experience representing clients recovering from puncture wounds. We can help identify medical specialists who are qualified to treat your injury (often not one of the posted panel doctors) and we will not allow the insurance company ignore your unique recovery needs. Please call me at 770-351-0801 to discuss your treatment and recovery options.